Ofsted chief Amanda Spielman has warned that underperforming schools can get caught in a culture of "disadvantage one-upmanship", where schools focus too much on their pupils' deprivation. She likened it to a Monty Python comedy sketch where people compete with claims to have had the toughest childhood. Ms Spielman was presenting her annual report, which highlighted a small core of persistently underachieving schools. But she said disadvantage was not an excuse for low achievement. The Ofsted chief suggested schools seemed sometimes to be competing over how many pupils were on free school meals or how many did not speak English as a first language. "I think people become absorbed by this narrative," said Ms Spielman at the launch of the annual report from England's education watchdog. "They've got big and daunting challenges, but we want to encourage people to look past them. We want them to focus on what can be done." 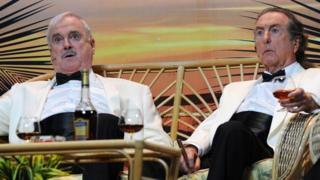 She likened it to the Four Yorkshiremen comedy sketch performed by Monty Python, where characters make increasingly exaggerated claims about hardship when they were growing up. The report highlighted schools from this year's round of inspections which had repeatedly failed to improve, with around 80 primary and 50 secondary schools below the level of "good" in inspections since 2005. There are also about about 500 primary and 200 secondary schools which have been rated as requiring improvement on their previous two inspections. These struggling schools were most likely to be in disadvantaged areas with a high proportion of poor white pupils, to have a high turnover of staff, and heads and teachers facing "burnout". But Ms Spielman said that there were thousands of other schools facing similar challenges which were performing much better. The annual report shows that overall 90% of all primary schools and 79% of secondary schools are rated good or outstanding. Although outstanding schools are no longer routinely inspected - and almost one in 10 have not been inspected in the past 10 years. But the Ofsted chief said against a positive backdrop it would still be wrong to "turn a blind eye" to weaknesses. She warned of an ongoing problem with unregistered religious schools which were operating illegally and which could be teaching extremist views and seeking to "isolate young people from the mainstream". Ofsted has warned for several years of children being taught in squalid conditions with inadequate lessons. Ms Spielman called for stronger rights for inspectors to intervene and seize evidence, such as books or documentation. She warned of such schools promoting sexist or homophobic views. Ms Spielman's report also raised particular concerns about education standards in young offenders institutions, which she said could be "extremely poor". "Without access to a proper, decent learning and training we are passing de facto life sentences on young offenders," she said. Responding to concerns about schools which seemed to have "intractable" difficulties in improving, heads' leader Geoff Barton said Ofsted could be part of the problem. When schools were "stigmatised" by bad Ofsted reports, recruiting staff and pupils became more difficult and schools could be "trapped in cycles of underperformance", said Mr Barton, leader of the ASCL head teachers' union. He said the problem was exacerbated by a "teacher recruitment and retention crisis" and the "underfunding of schools". Paul Whiteman, leader of the National Association of Head Teachers, said the high performance of so many schools was "all the more remarkable against the backdrop of austerity and all the added pressures that brings". Angela Rayner, Labour's shadow education secretary, said: "The fact that under the Tories schools have consistently struggled to improve, have struggled to recruit staff and had high levels of turnover should come as a wake-up call." A Department for Education spokeswoman said: "We are targeting the areas that need the most support through our opportunity areas. "And by investing £280m over the next two years to target resources at the schools most in need to improve school performance and deliver more good school places."